Launched in 2000, the Zeiss Axiovert 200 has all the features needed for brilliant imaging results. Combined with our LM microscope adapter solutions and a commercially available DSLR or system camera, the images seen through the microscope can also be documented in full quality. 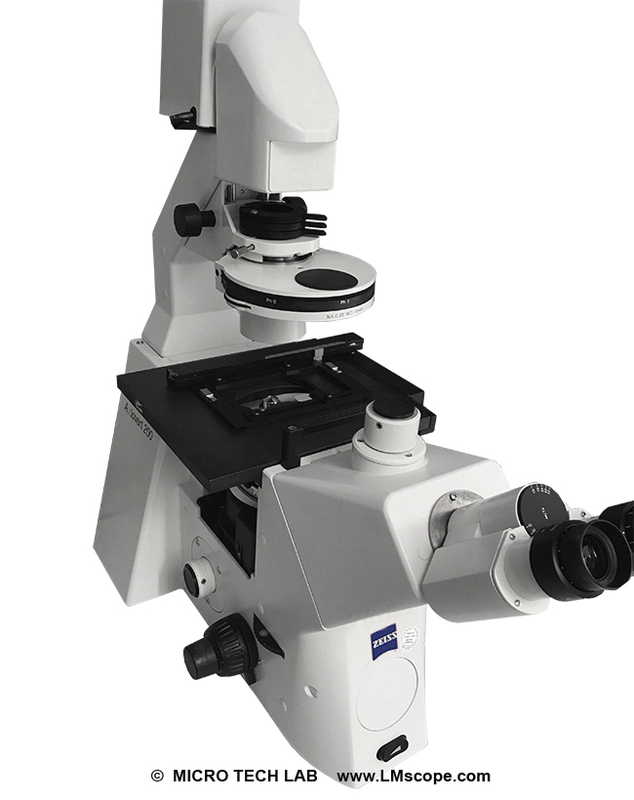 The Axiovert 200 is the epitome of flexibility: a working distance that is quite large for an inverted microscope and even accommodates the condensers from the family of upright microscopes, three different tube types (binocular tube, trinocular tube with phototube and ergotube) and a vast range of observation techniques make users rejoice. • With the Varel series of objectives, users have the unique possibility of imaging specimens both three-dimensionally and in phase contrast – without having to change the objective. • Users also can choose between two methods for Differential Interference Contrast (DIC): the well-known Nomarski system and DIC according to Sénarmont. Further information about the differences between the two methods is provided on the manufacturer’s website. • When it comes to fluorescence imaging, the microscope’s objective turret has 5 Push&Click filter positions with 23 mm field of view. For users that want even more, a motorised 8-position turret is available. Reflected light fluorescence enables imaging over the entire spectral range. • The method for rotating the reflector turret is called “Soft Click” because it is exceptionally smooth and thus minimises vibration. • Because ergonomic considerations were specifically taken into account in the design process, the Axiovert 200 offers a wealth of ergonomic benefits, such as ergotube, configuration for left- or right-handed operators, LCD display, etc. 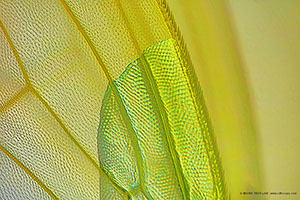 Especially in photomicrography, the presence of stray light is always a major issue. The patented Zeiss Light Trap minimises interfering stray light, which provides an excellent signal-to-noise ratio. Of course, one particular point of interest for us is the availability of camera interfaces on a microscope. The Axiovert 200 offers a multitude of connection options: two sideports (left and right), one frontport, the trinocular tube with photoport and a dual video adapter provide a wide range of options for digital documentation. The image above shows the camera mounted on the photoport of the trinocular tube. 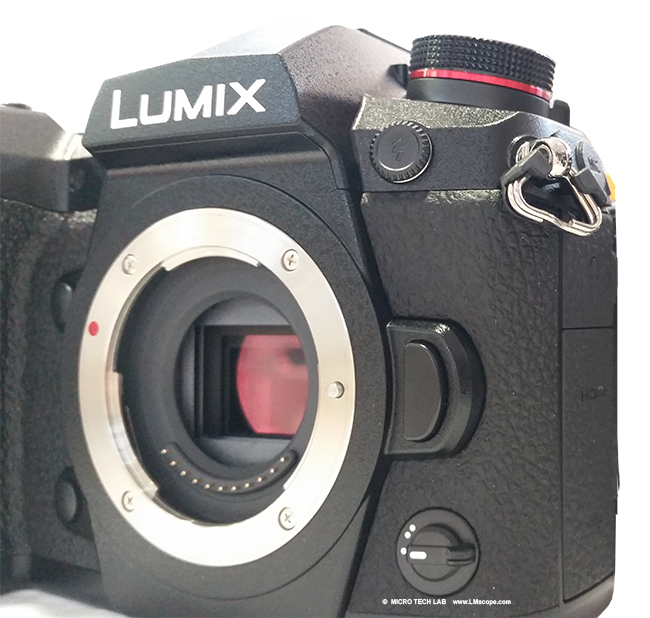 For photomicrography, we recommend cameras with large sensors, such as commercially available DSLR/DSLM cameras, which not only outperform C-mount cameras in terms of price, but also in regard to quality. With our LM digital adapter solutions, DSLR cameras, system cameras and C-mount cameras can be attached to the Axiovert 200. They are equipped with a high quality, plan achromatic precision optical system and are customised according to the specific microscope-camera combination used – either as wide-field adapters for a maximum field of view or as top-quality standard adapters. The modular construction of our adapter solutions facilitates maximum flexibility. More information about the flexible use of our products is available here. In addition to the manual version, Zeiss also offers a motorised version (Axiovert 200 M). The motorised components are a motorised condenser and a reflector turret. Additional features include different stage versions, temperature control and incubation, laser scanning and the features needed for extensive live cell imaging applications. They complement the Axiovert 200’s roster of high-performance functions. Conclusion: The Axiovert 200 is an excellent microscope that can proudly bear the Zeiss brand name. It combines quality and versatility in one instrument. Used in conjunction with our LM adapter solutions and modern, large-sensor DSLR and system cameras, the Axiovert 200 ticks all the boxes for brilliant imaging results.